In a hugely anticipated game, Letterkenny met Holywood at Kerr Park in Belfast on Saturday in a cup and league double header. Heading in to the game off the back of six straight wins, Letterkenny travelled with confidence but it was Holywood that got off to to the better start when scrum half Charlie Burowes ran in untouched from the back of a scrum. Early score 5-0. Shortly after, Holywood posted their second score of the day when fullback Joel de’Pledge found space down the left wing before feeding the ball to Ryan Young to crash over in the corner. Difficult conversion missed leaving the score 10-0. Letterkenny fought back with a try of their own after a lot of heavy pressure inside the opposition 22, when James Lee McLaughlin bounced the attempted tackle of de’Pledge to score in the corner. The Letterkenny barrage continued and before long the Holywood tighthead prop was brandished a yellow card for consistent fouling from the Home team. Letterkennys dominance at set piece was also evident as the lineout functioned well and a solid scrum was a source of comfort for the visitors. So too was the performance of second row Ben Curran, who showed no sign of nerves on his senior debut. Letterkenny made their extra man advantage count eventually when Ciaran Clarke rumbled over from a pick and drive. No conversion for McGinley and the score remained 10-10 as both kickers struggled with the windy conditions. Then before half time Holywood delivered a sucker punch when their captain Dave Perry found a gap in the Letterkenny defence. Jordy De’Pledge adding the conversion to bring the score to 17-10 at the break. The second half saw Letterkenny play with the wind at their backs forcing Holywood to keep the ball in hand a bit more. The home side came out strong once again and just as they had done in the early stages of the match, they were able to spread the ball wide and capitalize on loose Letterkenny defence. Three tries in quick succession really putting the contest out of reach, a brace of which came from wing Aaron Corbett showing blistering pace on both occasions. Letterkenny’s fight was not done however as they fought tooth and nail to get themselves back in to the game. Brian McGinley breaking from deep on more than one occasion caused the Holywood defence mass panic but in truth had Letterkenny been half as clinical as their opposition, then the result could have been much different. Christopher Digimas scored Letterkenny’s third before James Lee McLaughlin got his second of the day showing great footwork to create the space for himself to score beneath the sticks. McGinley scoring both conversions but all too late for a gallant fight back. 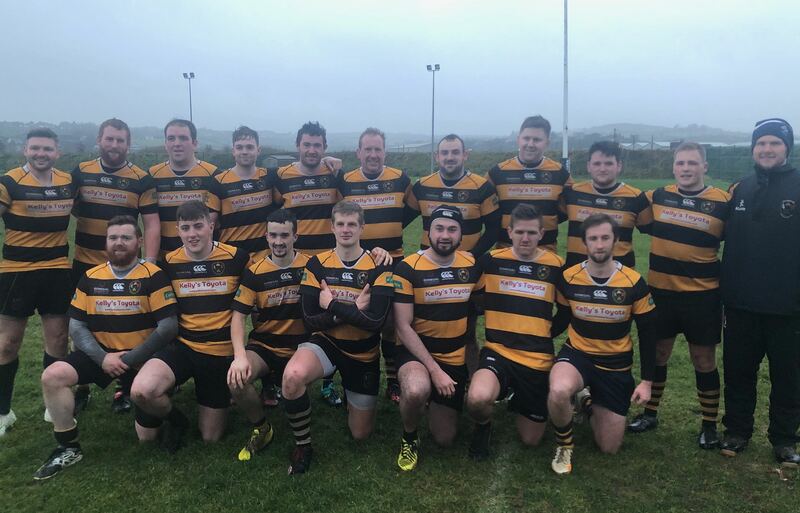 It finished Holywood 36-24 Letterkenny as the Holywood men march on to the semi finals and Letterkenny bid farewell to the Gordon West for another year.